Our gardens and outside spaces deserve as much attention as our interiors – they can provide the first impression of our homes to visitors, a sanctuary to escape to in warm weather and an additional living and entertaining space. While not all of us are blessed with large gardens and bags of outside space, there are plenty of ways of improving what you do have and making it work for you. Perhaps you only have a roof terrace or balcony? You can still get green-fingered with plant pots and raised flower beds, and you can create an outdoor haven with decking, seating, outdoor lighting and various accessories to entice everyone outside. 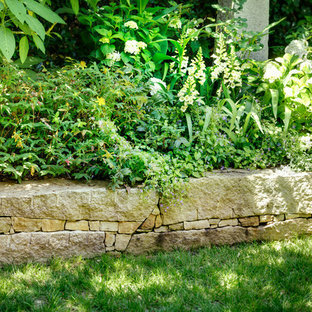 If you do have a bit of space to play with outside, then aside from a lawn in your garden, you could add some extra elements to help you enjoy the space even more. Adding a patio will give you the perfect area for dining, lounging or even a bit of outdoor cooking, and if you choose to go for a veranda you’ll have a bit of shelter from the hot sun or the rain while still enjoying being outdoors. If space and budget aren’t too much of a problem then a swimming pool or hot tub could be next on your list. 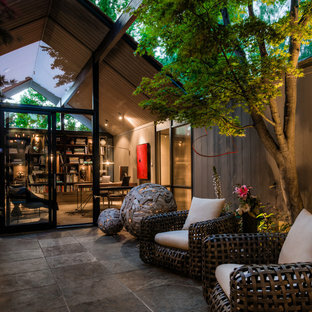 Take a look at the various garden photos, as well as veranda, terrace and balcony, patio, lawn and swimming pool ideas that are available on Houzz to help you decide what you’d like in your garden or slice of outdoor oasis. 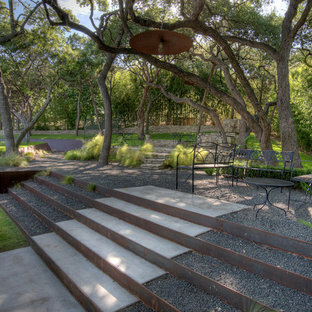 Inspiration for a contemporary patio in San Francisco with no cover. Photo of a modern swimming pool in San Francisco. 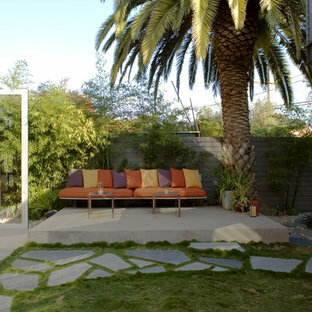 Design ideas for a modern courtyard patio in Los Angeles. Request Free Quote Curb appeal for your homes front yard entrance. 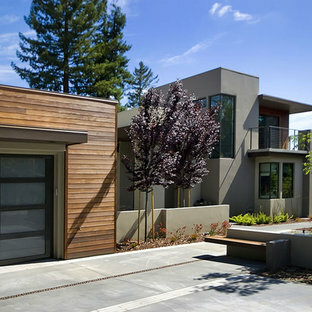 Design ideas for a contemporary front garden in San Francisco. 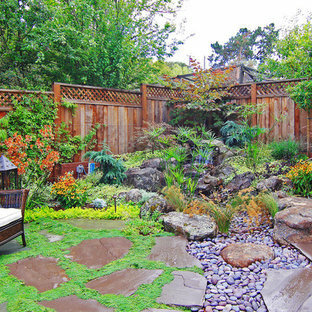 Contemporary sloped formal garden in San Francisco with a fire feature. 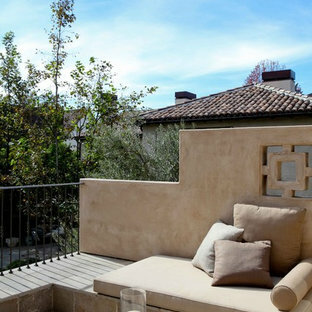 Photo of a mediterranean balcony in Los Angeles. 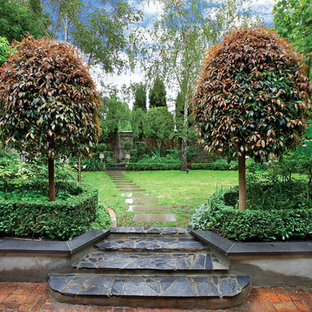 Andrew Renn Design, Beautiful gardens of Melbourne Australia. Photo of a contemporary garden in Seattle. 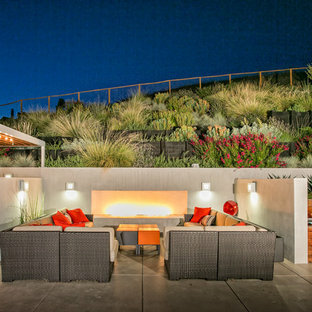 This is an example of a contemporary patio in Orange County with a fire feature. This beautiful brand new construction by Spinnaker Development in Irvine Terrace exudes the California lifestyle. With approximately 4,525 square feet of living space on over 13,300 square foot lot, this magnificent single story 5 bedroom, 4.5 bath home is complete with custom finish carpentry, a state of the art Control Four home automation system and ample amenities. The grand, gourmet kitchen opens to the great room, while a formal dining and living room with adjacent sun room open to the spectacular backyard. Ideal for entertaining, bi-fold doors allow indoor and outdoor spaces to flow. The outdoor pavilion with chef’s kitchen and bar, stone fireplace and flat screen tv creates the perfect lounge while relaxing by the sparkling pool and spa. Mature landscaping in the park like setting brings a sense of absolute privacy. The secluded master suite with custom built-in cabinetry, a walk in closet and elegant master bath is a perfect retreat. Complete with a butler’s pantry, walk in wine cellar, top of the line appliances and a 3 car garage this turnkey custom home is offered completely furnished. Inspiration for a rustic garden in Philadelphia. 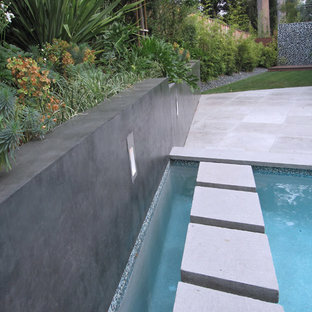 Inspiration for a contemporary infinity swimming pool in Los Angeles.